Activision's beautifully designed Call of Duty 2 pushes the Xbox 360 hardware to new heights with some of the best visuals in any WWII shooter to date. The realistic graphics make you feel like you're actually on the battlefield. The solo campaign is surprisingly long and deep, with multiple branching options that allow you to select which order you complete missions. While the market is saturated with WWII shooters, Call of Duty's production polish and visceral gameplay make it stand out from the pack, creating the most immediately satisfying Xbox 360 launch title. The visuals show off the hardware's power effectively, and is complimented by solid gameplay, and controls which makes Call of Duty 2 a must-own title for the new system. While there have been several impressive titles released at Xbox 360's launch, one title seems to have risen to the top of the heap in terms of critical acclaim - Call of Duty 2. Great things have been promised for the console, and this release definitely lives up to expectations with its stunning visuals that will leave you breathless. The robust environments are large in scale and scope, with ruined cities, desolate sun soaked deserts and bleak beaches. The feel of a WWII battle has been recreated faithfully from the weapons, vehicles and, soldiers' uniforms, with an incredible amount of detail, putting you right in the middle of the action. Each object in the game looks incredibly realistic with detailed texture mapping and lighting effects used to make a believable environment. 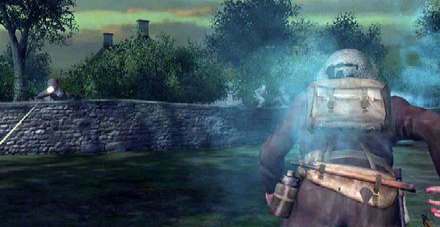 Call of Duty 2's weather and environmental effects are also quite impressive, with the fumes from smoke grenades actually creating clouds that react naturally throughout. The level of detail extends to the character models as well, each soldier moves realistically, with an incredible level of natural movement that makes them feel very much alive, and also quite dangerous. The smallest details, such as light fixtures and tracks in the snow have been given a lot of attention to create a coherent world that seldom shows its seams. This high level of polish extends to the voice-overs, with the chaotic, panicked screams of your soldiers and the enemies adding to the sense of chaos and drama surrounding these events. Taken together, these elements create one of the most visually impressive FPS titles on the market, showcasing the Xbox 360's hardware more effectively than any launch game to date. While the graphics are impressive, what really matters is what lurks below the surface, and players will find a solid game that lives up to the presentation. 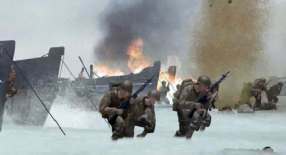 Taking place during the heat of World War II, Call of Duty 2 places you in the middle of intense combat missions throughout many fields of operation. The game takes you to a variety of locations including Russia, Africa and Asia as you battle the forces of fascism. Each mission is presented in a linear fashion, where you need to complete a series of objectives in order to progress to the next checkpoint During the course of the game, you spend the majority of your time trying to survive the onslaught, while also trying to perform other tasks such as destroying tanks, repairing cables and more. The designers deserve a lot of credit for adding these elements, which makes the game more than just a mindless shooter, though combat is never too far from the surface. Shooting itself is also quite varied, and you won't get very far just rushing in - you'll need to find cover, shoot from a distance and keep yourself safe while keeping an eye on your comrades as well. In order to protect yourself, you can crouch down, crawl and hide behind walls. However, you aren't always safe standing still since the enemies use grenades frequently. Fortunately, the game includes an onscreen indicator when one of these are thrown, allowing you a chance to get away from the explosions. You can collect ammo and weapons from fallen soldiers, and can also collect these items along the way. Firing the guns is fairly simple using the onscreen crosshairs, but players can also use the reticle at the end of each gun to zoom in on the action, allowing for more accurate shots. This is particularly useful when you encounter a sniper or an enemy taking shelter behind cover or hiding behind a wall. However, you're standing still when you use this technique, which makes you more vulnerable to enemy fire. Call of Duty 2's missions feature a straightforward structure with most objectives clearly laid out before you, making your mission progression linear for the most part. There are several points later on where you can choose a different path, but these are fairly minor divergences. The gameplay itself is straightforward with a variety of different weapons ranging from machine guns to rifles available to use, with the addition of both smoke and frag grenades as well making up your basic arsenal. Players can also use embedded guns to shoot enemies and can perform a variety of tasks, such as placing explosives on tanks, with the press of a single button. Unlike many other FPS titles on the market, there's no life-bar in COD2, instead the game relies on a more intuitive system. When your soldier takes a hit, the arrows on your radar turn red, and you'll hear heavy breathing. A message will appear on screen telling you to get to cover, where your health gradually regenerates, if you don't take further hits. While this isn't the most realistic approach to health damage, it allows the game's pacing to move much more smoothly without excessive interruptions. However, this system also has its drawbacks, since you never really know how close you are to death, it makes it difficult to gauge how much damage you've actually taken. This is particularly true during the heat of battle, where the intensity of the noise makes it difficult to hear your soldier's breathing. However, in the end, this system works surprisingly well, allowing you to concentrate on the task at hand, and reduces the number of reality suspending health packs usually found in FPS titles. While most FPS titles suffer from predictable AI, the enemies in COD2 are quite intelligent and attack you relentlessly. They take cover behind walls and objects, regroup and ambush players and seem to have an endless supply of reinforcements. This gives the battles an epic feel where you feel you are battling an entire army, not a few soldiers here and there. On the other hand, the other soldiers in your squad are intelligent and can attack in groups and wipe out enemies ahead of you without being ordered to do so. They'll also use cover fire to protect you and can give you useful information along the way. This doesn't mean that they don't suffer, and you'll see plenty of your team fall during the battle, giving the game a gritty realism that captures the brutal reality of war, with the unexpected and unpredictable nature lending a sense of chaos and desperation to many of the events you'll face. 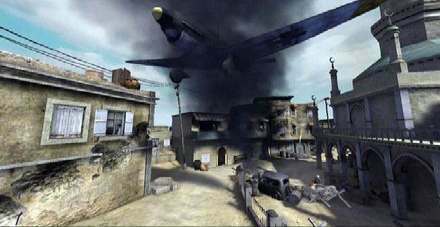 These elements give Call of Duty 2's single player game an unprecedented sense of realism, with a cinematic feel that further enhances the game's atmosphere and urgency. The fact that each mission ties into the larger story of World War II gives you a strong motivation to keep playing. 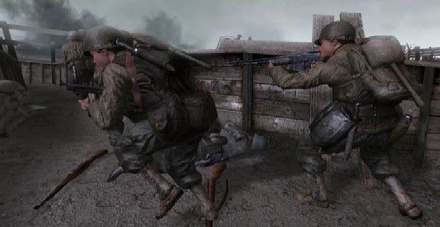 Call of Duty 2's cut scenes feature actual footage from the war and, along with the character's logbook between each mission, helps to complete the players immersion into the game. The strong single player campaign is impressive and quite addictive, with incredible production values adding to the intensity, which makes it easy to overlook the game's solid multiplayer modes. Logging onto Xbox Live allows you to compete in variety of modes including standard deathmatch and team modes, along with other modes that accurately mimic the single game's cooperative play. There's no loss in frame rate or intensity when playing online, and these modes play just as well as their off-line counterparts. Each map has the same level of detail as the single player missions, and are well designed for online play. You'll encounter some of the same areas, and this familiarity helps to make the online modes feel more cohesive. As you'd expect, playing with Xbox Live is a joy, with a smooth interface that's easy to navigate, making setting up and joining games an almost painless task. Call of Duty 2's multiplayer mode is excellent, with polished and challenging gameplay that will keep players occupied for many happy hours. The sheer excellence of its online component is emblematic of the game as a whole - it sets new levels of visual quality while offering a solid gaming experience that is appealing and challenging at its core. While the game's solo campaign is too linear at points, and goes by too fast in some areas, there's quite a bit of enjoyment to be had while it lasts, and the visual quality is sumptuous throughout as well, making Call of Duty 2, without question, the best FPS on the 360 to date.